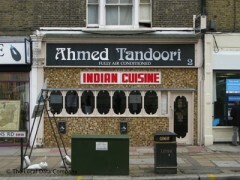 About: Ahmed Tandoori serve a variety of popular Indian dishes to eat in or take away. Oh! Dinner out at Ahmeds is a real gastronomical treat! the food is typically Indian- little spicy and delicious. What's great about Ahmed is the service and ambience apart from great food... the staff is very pleasing too who customise the order as much as they can! I've done some building works in this restaurant. I would never ever eat enything there! I've been scare to go to the kitchen because of mice and rats (I'm just afraid of the desises, in the past I've been biten by the rat). Cockroaches everywhere... walking on the meat and vegetables lefted on the floor... Disaster. Don't eat there!